If you ever stumble upon a red building with a line out the door near downtown La Mesa, chances are you are at The Hills Local Pub. The Hills recently celebrated their second anniversary with fans and supporters in partnership with the La Mesa Chamber of Commerce. The great atmosphere and lively chatter inside the pub is one of the first things you notice when you walk in the door, instantly making it a comfortable place to unwind. The creativity of the building is another novelty, from the steam cannons that shoot out over the bar to the bathroom doors that make you think of an airplane. Past the visual appeal of the restaurant is the great staff that always has a smile and makes you feel at home, as well as the jovial patrons who are quick to strike up a conversation. One of the owners, Ben Clevenger, contributes this service to much of The Hills’ success. The restaurant takes part in their own charitable events, including “We Care Wednesdays,” where a portion of the proceeds from that day go to a specific charity. Mary England, president of the La Mesa Chamber of Commerce, has great things to say about the program. “They have made such a difference in our business community, as well as for our local charities,” she said. 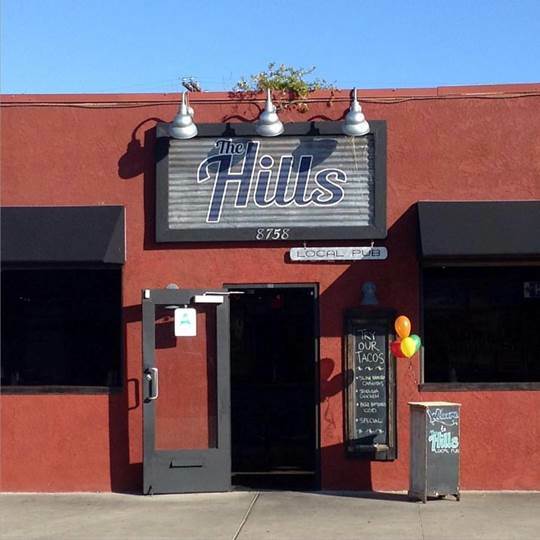 For more information on The Hills Local Pub, visit their website at thehillspub.com. —Sam Estrada is a legislative intern for Senator Joel Anderson and a junior at Grossmont Middle College High School.